The dogs roam freely. Like everything else in Ethiopia, they have a purpose. They are not pets. They are given some food, but mostly they just scavenge. They are kept to guard the homes at night. So when the sun is setting, all the animals are brought into enclosures except the dogs. And as the hyenas prowl, letting out their long, low growl, the dogs are set on end! Barking wildly out of fear, they know that they can scare off a night intruder of the human sort, but they are no match for the hyena. Such is the life of a dog in Ethiopia. 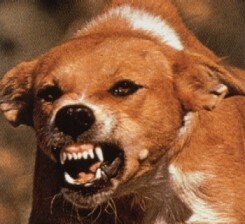 Because of the roaming, semi-wild nature of the Ethiopian dogs, rabies is commonplace. I have seen many a rabid dog in Ethiopia. The Ethiopian people don't mess around with such an animal; they quickly gather to stone the animal to death. They know that if a rabid dog bites someone, that person will certainly die. It is a disease with 100% mortality. The post-exposure treatment for rabies is almost non-existent in Ethiopia. The World Health Organization estimates that 55,000 people in Africa and Asia die each year from rabies. It is an agonizing, painful death! Here in America, such a death is extremely rare. Decades ago, our government did a public health campaign to have all dogs vaccinated. Now the rabies exists almost exclusively in wild animals...raccoons, possums, bats, etc. But Ethiopia is not America. And so the people continue to die from rabies. There is a 100% chance of death if you are bitten by an infected dog. The incubation period for rabies is from a few days to several weeks. This buys some time. If the post-treatment is given before symptoms develop, there is an excellent chance (almost 100%) of recovery. But after symptoms have developed, it is too late. In southern Ethiopia, there is only one place where rabies treatment is available. It is a small Catholic clinic about 6 hours' drive from Burji; this assumes the road is open and the last dose has not been given. The treatment consists of an immunoglobulin shot at the site of the bite as soon as possible, and then a series of 4 rabies vaccine shots over the next days and weeks. This medicine is produced by many different vaccine companies. Worldwide, there is not much oversight of the quality of the vaccine. In 2009, the 2nd largest producer of the vaccine in China sold tens of thousands of the vaccine from a botched batch; they estimate that at least 30,000 doses are still unaccounted for. Additionally, the possibility of contaminating the vaccine with blood-borne illness (like HIV or Hepatitis B) is a significant concern. So the world has become wary of the suppliers. The nurses at the Burji Clinic have repeatedly asked us to supply them with the treatment for rabies. People in Burji are dying because we do not have the immunoglobulin and the vaccine. I have found a reliable producer here in the States. I have talked with them. We can have the vaccine for our clinic. The vials of immunoglobulin and vaccine that would be needed for a 150-pound adult will cost us $2,470, plus shipping, taxes, customs (if any). I'm estimating total cost at about $3,000!!! $3,000 needed to save one life from rabies. Amazing! Is one life worth that much money? If it was our spouse's life, or our child's, we'd be quick to answer YES! Is an Ethiopian's life any less valuable because they are far away, because they are poor, because they are uneducated? So I lay before you this need..... $3,000 for one rabies treatment... $6,000 for 2 rabies treatments... $9,000 to save the lives of 3 precious Ethiopians in Burji. Do we hear the voice of Jesus? PS...If God is appointing you to help, please make checks payable to Bethel Hill Baptist Church, write "Operation Ethiopia, rabies" in the memo section, and mail to c/o BeckyLynn Black, 2691 White House Rd., Nelson, VA 24580. From the patients and families in Burji, Ethiopia....thank you!